Application: Direct mount cobot end effector for advanced assembly adds robot screwdriving to your collaborative workspace. 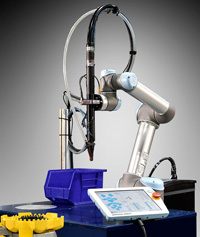 The VCM-3X.2 collaborative robot fastening system is a complete feed and drive package for use by machine builders. Includes an automatic feeder, programmable drive system, skeleton robot program, and end effector for direct mounting to a collaborative robot wrist. The light weight end of arm tooling (EOAT) allows maximum robot movement speed without sacrificing collaborative safeguards, having an average payload mass of 2.25 kg. Most applications will not require traditional safety hardware like light curtains or mechanical guarding making payback time faster. 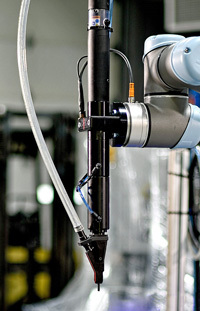 The cobot module comes complete with Visumatic's field-proven power bit advance, bit position sensors, and a fastener delivery confirmation sensor ensuring a repeatable joining operation. The Visumatic cobot system has pre-programmed fault recovery logic to automatically continue screwdriving after a force safety stop. This occurs without operator intervention, maintaining process efficiency. Your browser does not support the video tag. 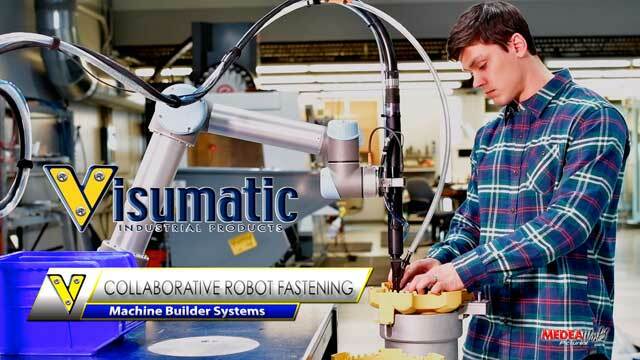 View the collaborative robot screwdriving video on Visumatic's YouTube channel. Watch the full HD version collaborative robot screwdriving video on Visumatic's YouTube channel. Automatic screw feeding and driving SCARA robot for high volume high torque applications designed for lightning fast product assembly.